"It's very tough for me to focus. I'm like: Look, something shiny! No, focus. Oh, there goes a butterfly!" 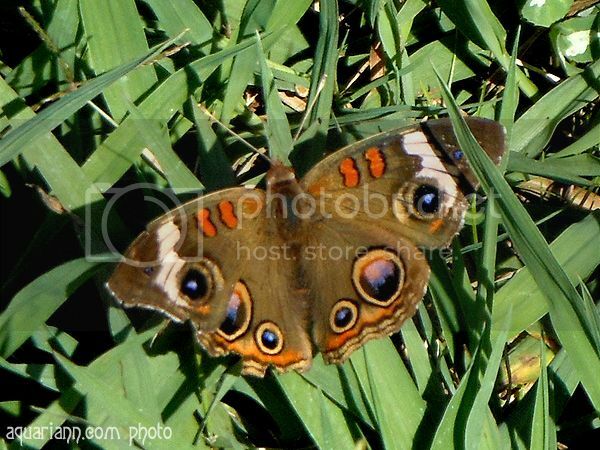 Usually I go to the Jamestown Settlement to learn about American history, but during our last trip to Virginia, I just chased this beautiful brown butterfly with blue eyespots around their Visitor Center. Butterflies are beautiful! Thank you for sharing and hosting a link-up! Have a wonderful week! Beautiful butterfly! Great capture Kristin. Thanks for hosting. Those butterflies are so interesting. I have only recently learned they were buckeyes. I think they are rare around my parts (Utah) but I could be wrong. Thanks for linking up. The colors are unique. I think they are pretty. That thing is gorgeous. We don't have butterflies like that around here. that butterfly is so pretty! Wow, that's gorgeous! And unique; I've never seen one quite like that before. What an incredible capture! My mother-in-law would love this — she's a huge butterfly aficionado. Beautiful butterfly photo! I don't think I've ever seen one of those. Well done! Worth chasing him down! It is a beautiful butterfly. What neat markings. Not so sure how I'd feel if it landed on my head, though. It looks pretty big, as far as butterflies go. So, how long did it take to finally get this perfect shot, anyway? So pretty! I took my children to a butterfly exhibit a few years ago and they all really enjoyed it. Butterflies are such beautiful creatures! Nice photo, I have seen this one...Today I posted about butterflies too!!! I linked up, I'm #51 this week, thanks for the linky! As usual I'm not totally wordless, but there are tons of pics that's for sure! Visiting from the Wordless Wednesday Linky Hop, and I visited you first because you know I love all things BUTTERFLIES!!!! I can NEVER get a good shot of butterflies. And believe me…I've tried. Great job. My entry is #52. come by and vote for us?